Hope you enjoyed day #1 and day#2 sneak peeks. Today is day #3 sneak peek of Taylored Expressions June Release. I am showcasing two new products again today. 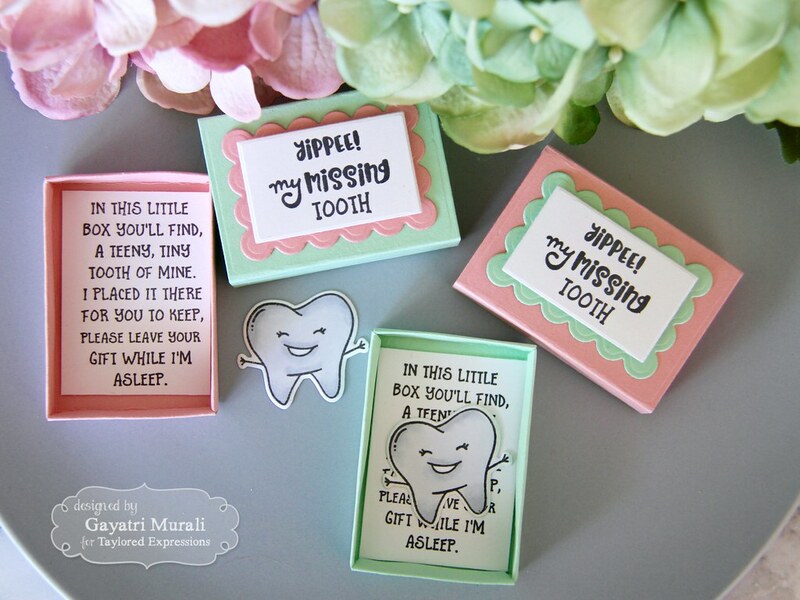 The first one is a stamp set and die combo called Tooth be Told. This is such a fun set especially for kids. 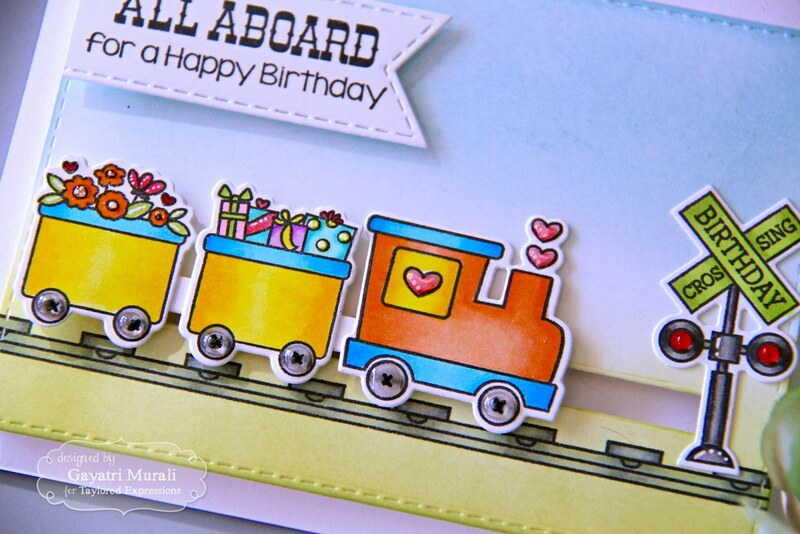 I used Taylored Expressions Match Box die to make my project. 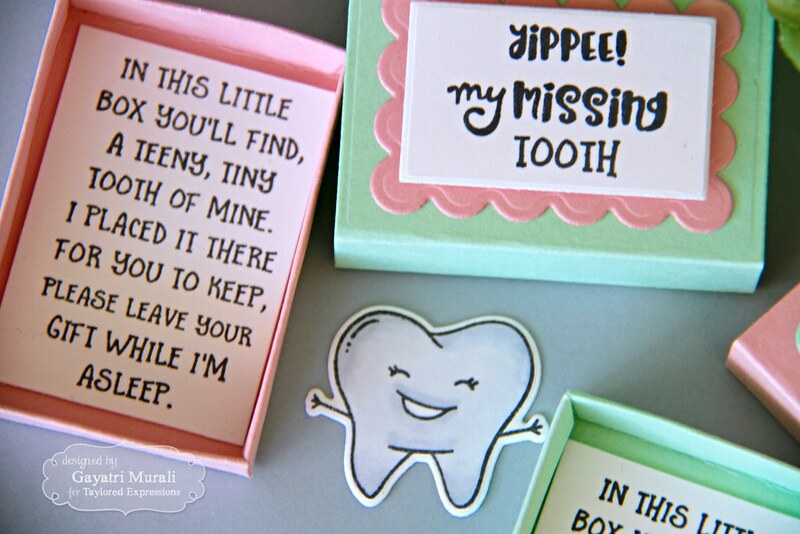 All the supplies used to make the matchboxes are listed below. The second product I am showcasing is called On the Right Track: Basics. This is a must have die in your collection. Awesome tracks to make slider interactive cards. 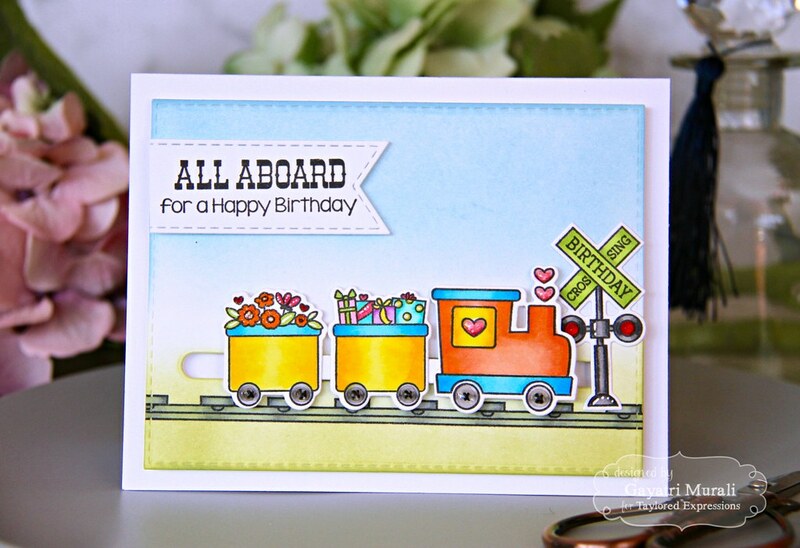 I used one of the older stamp set called Love Train and coordinating dies along with the longest track in the set to make my card below. 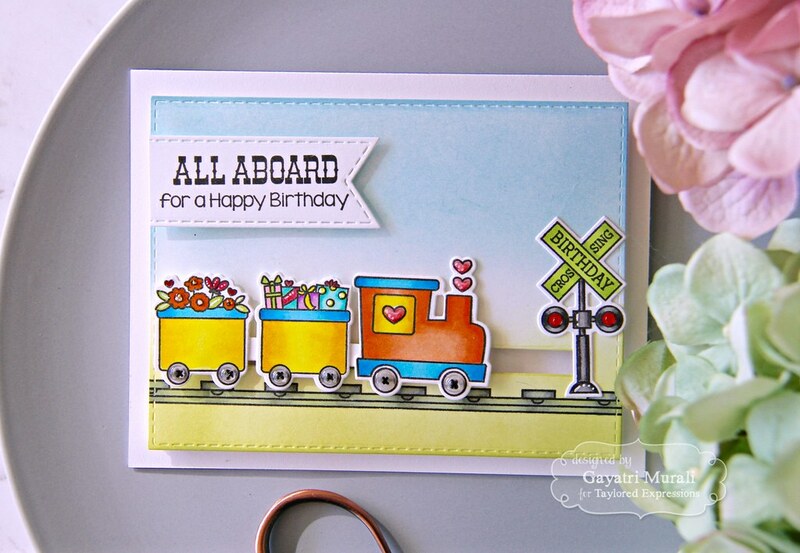 I stamped the train image and the lights on Sugar cube cardstock piece using Oreo hybrid ink and coloured them using copic markers. I them used coordinating dies to die cut them out. I die cut a sugar cube cardstock using the largest of the Stitched Rectangle stacklet die. I sponged Sprinkles ink on the top of the panel and Granny Smith ink on the bottom of the panel. I stamped the track from the stamp set on the bottom of the panel. I then used the longest track from On the Right Track: Basics die set to die cut on the threshold of the two sponged colours and above the track. I adhered the engine and the two carriages on the negative piece of the track to make it one piece. This makes the train a single piece to slide on the track. I used penny to make the slider element on which the train slides. The lights actually stops the train from sliding further out. To embellished I added wink of stella clear shimmer to the hearts and traffic lights. And covered the tires, traffic lights, hearts, some of the presents and centre of the flowers with glossy accents. 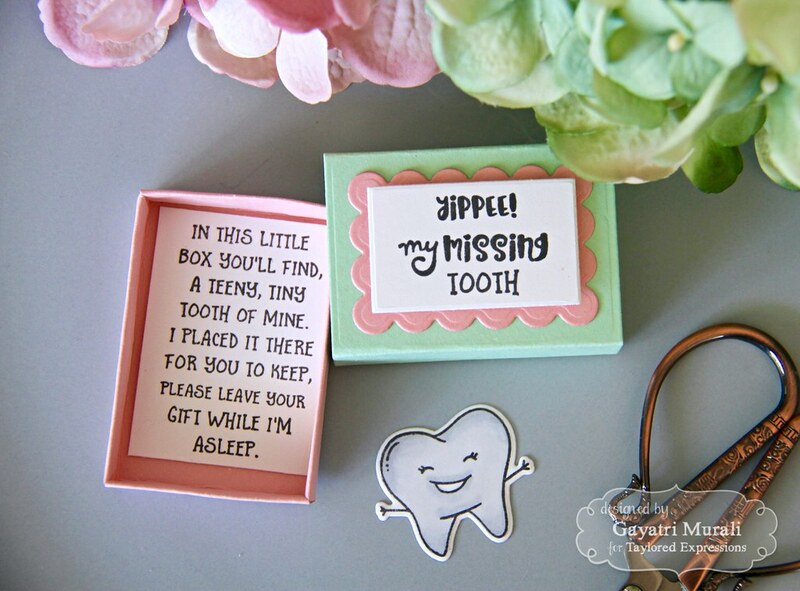 The sentiment is stamped on Sugar Cube cardstock and die cut using the second smallest of the Stitched Banner dies. As always Taylored Expressions is celebrating Release Week with some fabulous giveaways! Visit Taylored Expressions Blog to answer Taylor’s Question of the Day for a chance to win a prize from the latest release! For a limited time, earn DOUBLE CRAFTY POINTS on our Sunshine Cutting Plate! If you’re not a Crafty Points member, it’s free and easy to join. Just create an account at the TE webstore and you’re automatically enrolled to begin earning crafty points with every purchase. You’ll earn 48 Crafty Points on the purchase of our Sunshine Cutting Plate! Offer valid on qualifying purchases made between 9am CST on Thursday, June 8, 2017 and 11:59 pm CST on Sunday, June 11, 2017 and only while supplies last. Crafty Points are only available on purchases made via our retail site: www.tayloredexpressions.com. Check out Taylored Expressions Blog for more inspirations from other designers. I will see you tomorrow for the release of all the new products. Have a lovely day!